Last night I enjoyed a nice meal at the hotel in Jenolan. This morning I made myself a nice long black coffee in my room to go with my cereal. For this trip I bought a special coffee maker which you use a bike pump to force the water through the ground coffee. I've been enjoying it every day so far. Really beats the instant stuff I was drinking before. After breakfast I began my climb out of Jenolan Caves. To help my climb I got to enjoy the views to the right. I then headed for Lithgow. It felt nice to be on a sealed road again for part of today. Didn't take long to get to Lithgow where I restocked and grabbed a second breakfast. When I left Lithgow I followed the Glow Worm Tunnel Road towards Newnes. From previous reports of other riders parts of this road have become unridable, but that is not until I get to the glow worm tunnel. The first part of the ride after the State mine museum was pretty steep (approx 15%), but thankfully it began to level out. I was riding a good gravel road and passing tree plantations for the next 15kms before entering the national park. The road was still good but now I had the more familiar native trees to enjoy. About 10kms from the glow worm tunnel car park I came to a fork in the road. I took the left hand turn. You can take the right hand turn and walk across to see the tunnels. The road then began a nice gentle downward grade. It was clear now I was following the old rail line that led to Newnes. 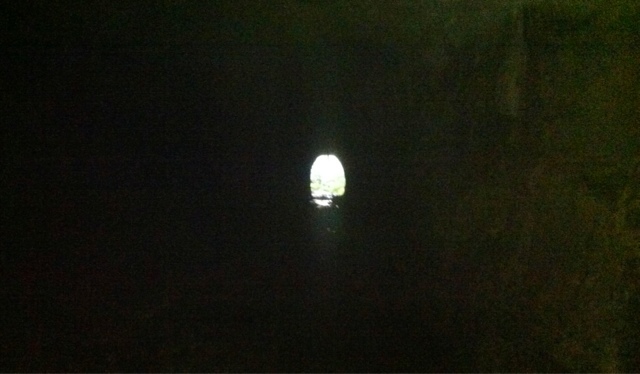 I was passing through massive cuttings which went through the sandstone until I got to my first tunnel. You need to make sure you have a good set of lights as it is pitch black inside. You can't see the other end due to it being curved. It was fun riding through the tunnel. At the other side there were impressive embankments and even bigger cuttings. It was amazing to see all the effort that was put in building this line. It took them about 13 months to build, but didn't last long due to the mine in Newnes not being as good as was expected. I got to the carpark, which meant the road is finished and I'd have to follow a foot path until I got down to the road into Newnes. First thing I had to do was unload and lift my bike over a locked gate. I could then reload the bike and ride the path until I got to a series of steps, where I unloaded, carried and reloaded the bike. 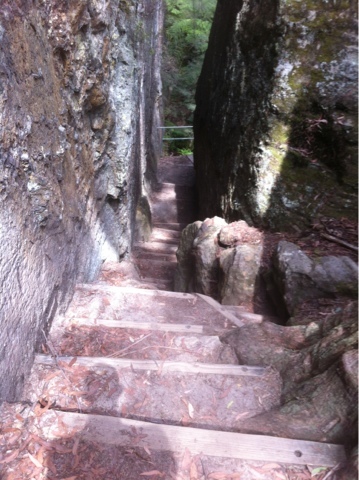 Just after these steps I got to the glow worm tunnel. Once again a good set of lights are needed. Also you need to watch the step, as the base to the tunnel is now a stream. When I got about halfway through the tunnel I switched off my light. It was pitch black, but then I began to see the glow worms. After a few minutes there were thousands of them glowing like stars throughout he tunnel. Absolutely beautiful. After a few minutes of being in awe of the glow worms I switched on my light and continued on my way out. 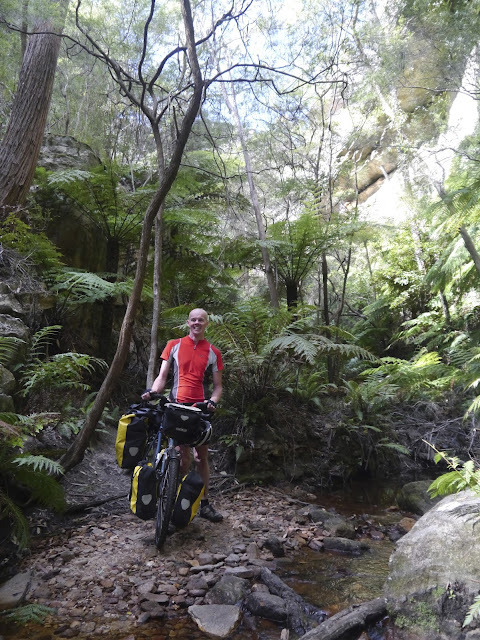 At the exit of the tunnel there were these massive sandstone cliffs with giant tree ferns. It was just breathtaking. After taking a few pictures I continued my trek along the path. There was a series of washouts (approx 4-6) where I sometimes had to unload the bike. So this slowed me down a bit, but I didn't mind as I was enjoying the scenery. You could even see the old rail sleepers which were left in place. I think I had to walk the bike for a total of about 1.5kms. 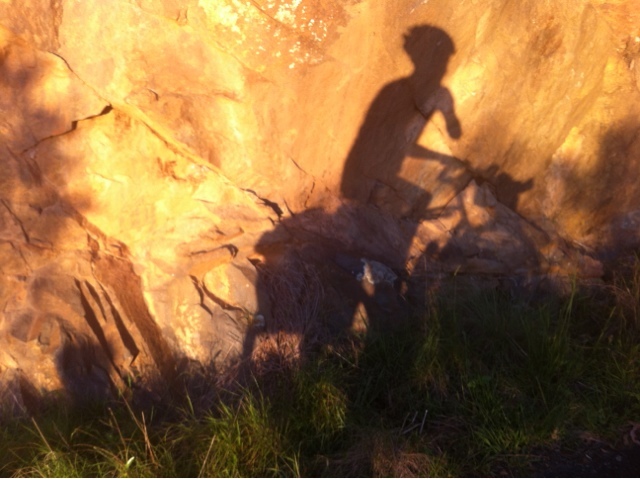 The remainder I was able to ride, sometimes very slowly to avoid some tree stumps. 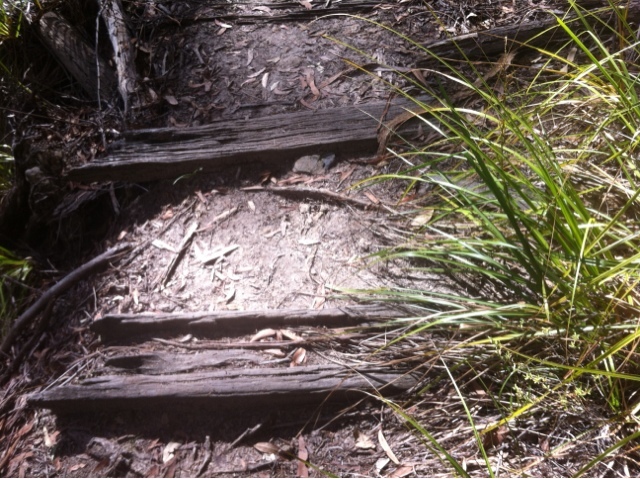 I got to the end of the path and followed the Old Coach Road down to the road into Newnes. It took me about 2.5 hours to get from the glow worm tunnel carpark to the road into Newnes. Remnants of the old rail line. I was told the steel tracks were exported to the UK during WWII to help with the war effort. I still had about 8kms to go until I got to my destination. The road was pretty flat, as follows the river, but was pretty sandy in places. So I dropped the pressure in my tyres and rode my granny gear, as this helped a lot with traction. I got to Newnes at about 5pm. Newnes is surrounded by sandstone cliffs. I found a nice campsite amongst the trees. There are about 3 other groups staying here. The only source of water is from the river next to the campsite. So I went down to the river and collected enough for the next couple of days. I then began to filter the water (took about 20 minutes). Today's ride has been pretty special, first with my nice climb out of Jenolan and then my amazing ride/walk through the glow worm tunnel. Finally to finish in a place as amazing as Newnes just made the day all the better. I didn't even notice I rode a 100kms today! 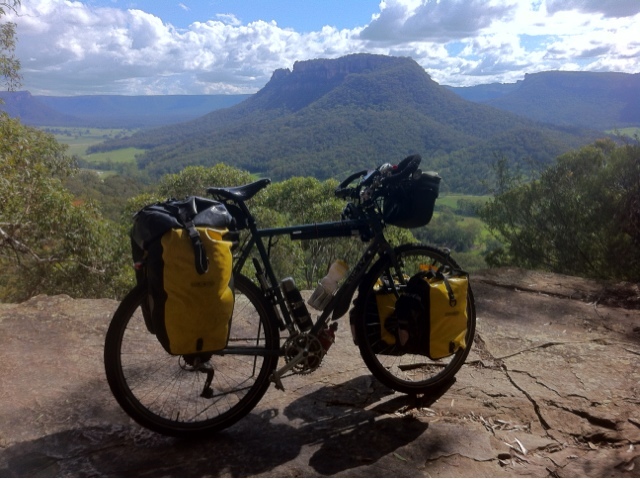 Tomorrow I'm going to be exploring Newnes and then on the bike again on Thursday.